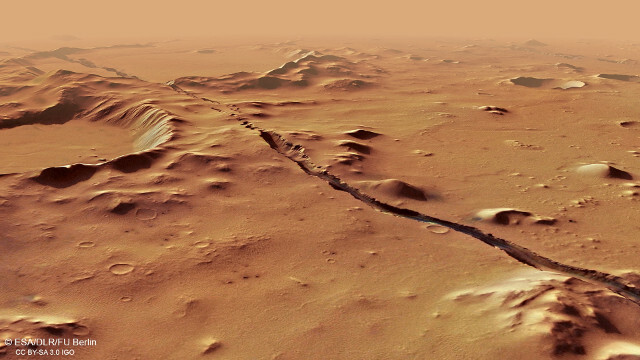 Volcanic activity affected the planet Mars when it was young, between 3 and 4 billion years ago. Subsequently it decreased progressively but the traces collected by the space probes in orbit are also showing much more recent volcanic activity and other tectonic activities. In the volcanic complex of Elysium Planitia, evidence of various activities dating back to a few million years ago were collected over time and some were described in an article published in the journal “Scientific Reports” in February 2017. In that region there are the Cerberus Fossae, which have a width that varies from a few tens of meters to over a kilometer. One possibility for their origin is that deep lava injections deformed the surface above as a result of the activity of the three volcanoes in the north-west. The plains of volcanic origin of the area are estimated to be around 10 million years old, so the fractures that pass through them must be more recent. In the lower right area of ​​the top image, which actually shows the northern area, you can see some rounded pits that suggest that a soil sinking process begun. In other areas the rounded pits can be seen connecting up to create longer cracks. Around a few cracks but also in the biggest crater in the image a darker material is visible, consisting of sand carried by the wind. Above the image, but actually to the west of that area, there are the Athabasca Valles, a system of outflow channels that among other things connects with that of the Cerberus Fossae. Those outflow channels are of relatively recent origin as well and that’s interesting because they were created by a catastrophic flood on a planet where there was water in liquid state in abundance almost 4 billion years ago, certainly not a few million years ago. A volcanic activity may have melted ice in the area causing a temporary flood from the Cerberus Fossae sufficient to form the Athabasca Valles. The tectonic activity in that area may still be ongoing and one day there could be even new volcanic eruptions. NASA’s InSight lander will land in the western part of Elysium Planitia on November 26, 2018 and with its instruments will monitor seismic and tectonic activity in the area offering important information to understand the processes underway.